Since Arcane Giant is out and the Wild Pyromancer + Commanding Shout Combo has proven to be good in OTK Worgen Warrior a combo Grim Patron Deck is playable again. Just felt like sharing this one again. It is probably the closest a deck has been to the old Warsong Commander Grim Patron Warrior. The deck has seen high legend play by multiple players. This is my version of the Grim Patron Warrior. I tried to built the deck all around card draw. The more cards you draw the more likely you will have the right cards to combo in your hand at the same time. Try to draw as many cards as you can while not loosing the board too much (the more you draw the more likely you will be able to play your little combos). Play a couple of Grim Patron if you know your opponent should not be able to clear them or just save them for the combo with Warsong Commander ( + Commanding Shout eventually). Also always keep in mind that you might be able to almost oneshot your opponent with a big Frothing Berserker especially after you got some value from Emperor Thaurissan. It could be good but i never saw a reason to put him in. I think I do not need him as a finisher. And playing him just as a big guy makes my opponent get more value out of his single target remove cards (which he usually does not get against this deck). I do not need face damage on like turn 4 or in midgame in general. I prefer playing Gnomish there for an extra card draw. It also is not the best finisher in this deck in late game. My Mana curve is pretty low already. Still it could work well with Acolyte, Grim Patron, Battle Rage. Why would I? The card is just too inconsistent in my opinion. Also I do not want to fill up my entire board with Grim Patrons. Because in case of AoE damage I need space for new Patrons to spawn. In general I think it is always much easier to say what card could be good in a deck than saying what card would I remove for that. And all the cards I am playing right now are working just fine. Also check out this 2 minute video FailCraft made about the deck. Very fun deck. 8-2 with it so far. I replace 1 arcane giant for 1 rampage, will that maybe work? Unless you have two copies of all this cards in your hand it would not be a OTK. Yea dropped from 13 to 15 with this deck on a straight lose streak. No wins. Hoping to find out what I am doing wrong. The combo is Arcane Giant (0 mana or very cheap due to you casting spells throughout the game),Charge, Inner Rage (1 or 2 if you have it), + Faceless Manipulator. Full combo is potential 28 Damage, 31 if you have axe. Giants discount themselves, so you don't need Emperor Thaurissan. It's extremely easy to get 0 mana Giant (or 1-2 mana), making it much easier to pull off combos. Much easier than full worgen + faceless combo. What and how do you protect yourself with all game if your waiting for that combo? Some decks I am dead in 5-6 turns and others I have straight been exhausted with no cards left to play. 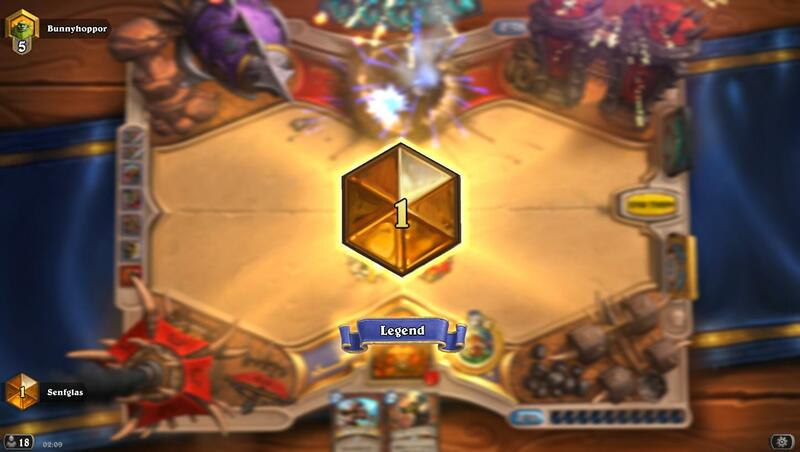 It's easiest to understand the deck play-style by watching Senfglas or some other good streamer play the deck. 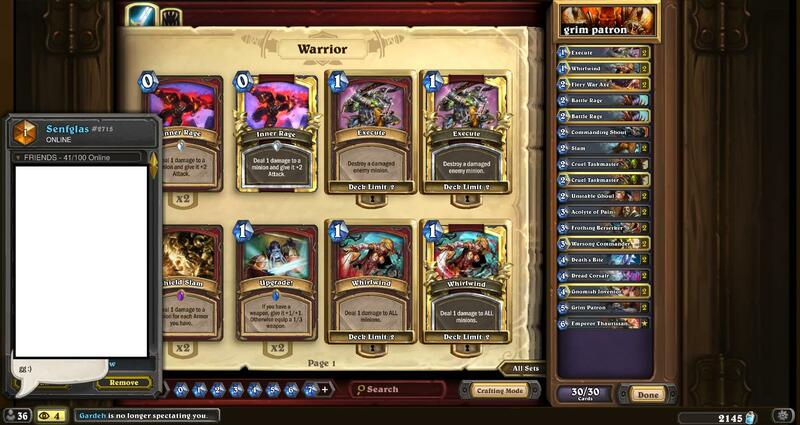 It's similar to the original Patron Warrior - it is complex and not a simple deck to pilot. Wild Pyromancer + Commanding Shout may be used for board clear, in conjunction with other spells depending on how large the opponent's board is. Grim Patrons can sometimes be a win condition on their own, but usually they will be used for board control + chipping away at opponents health in preparation for Giants finish. Ok. I literally am like 0-10 with this deck right now. Going to spend some time outside of ranked with it because I truly want to figure it out. Ill use my more comfy deck in ranked to hopefully make my climb back easier. It's a really difficult deck, but feels pretty good when you get the combo. If you watch Senfglas or Dog they make it look easy, but that's because they've played large amounts of games with decks like Patron. It's definitely a deck that takes a ton of practice, I don't have an amazing win-rate either but I keep practicing with it ever since I saw Senf and Dog play it. Can you update the guide to match the current deck :) Otherwise great! You lose the weapon, but you keep the effect, so I guess. How about Tentacle of N'Zoth? Is this deck better than the traditional patron warrior after the nerf? Like it has much better burst potential but i just wanna know. I feel like frothing beserker is a staple in any sort of "damage your own minions" warrior deck but i understand if theres just not space for it.